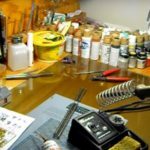 New to model railways and confused by the wires, leads, boxes and connections or want to refresh your knowledge of the basic electrics involved? Here’s the guide to get you started. 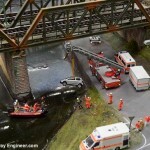 Welcome to the first in a series of articles on model railway electrics. 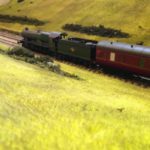 Overcoming articles I’ll be explaining, in simple jargon-free language, everything you need to know to set up and operate your railway regardless or scale or make – be it Hornby, Peco, Bachmann or another manufacturer. This first guide will start at the beginning but over the series, I’ll cover all you need to know, right up to complex digital layouts. 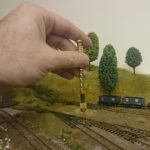 In case you’re wondering, aside from being a life long model train enthusiast and having built numerous layouts I was also a trained electrician and spend my working day building computer networks for large websites so electrics, railways and digital networks are my bread and butter. Read About for more information. At the heart of any analogue model railway starter set, such as those from Hornby or Bachmann, are three key electrical items. The transformer is often a solid heavy black plastic box with an attached lead and plug. It’s also possible for the transformer to be hidden inside the controller — which I’ll get to next — or sometimes disguised as a bigger than a normal plug. The transformer converts the electricity coming from the mains power wall sockets in your house to the lower, safer, supply needed to run the railway. I’ll discuss the fundamentals of electricity — AC, DC, volts, amps and current — in a future article. All you need to know is that there are two forms of electricity. There is AC, which comes out of the wall sockets, and DC – which the majority of electrical devices in your home run on – and the transformer converts one to the other. MRE Tip: Never connect the AC supply from the power socket directly to your railway. The track controller (also known as a speed controller) is another box – such as the one shown left which is the Hornby R8250 – but with dials and /or switches on it and is perhaps the most recognised aspect of railway electronics. The dials and switches setting the direction and speed of the trains, changing the power as it flows between the transformer and track. The thin wires are called layout wires and provide the link from the controller to the track and perhaps accessories. These wires are often black/white or blue and red. 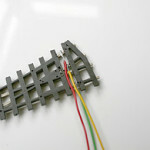 In beginners sets, the layout wires usually have some form of connecting clip that attaches the wires to the rails. It may be necessary to insert the wire into these clips (one wire per clip) and then connect the clip to the rails but that’s it. 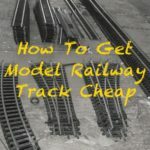 So all that’s required is to assemble the track: attach the wires to the track and controller, possibly connect the controller and transformer and then plug in the mains lead and you can start to run your trains. When attaching the layout wires to the controller, you come across sockets on the controller labelled ‘controlled’ and ‘uncontrolled’. For the track, use the one marked controlled which means it is managed via the dials/switches to set speed and direction. Uncontrolled is used for accessories and track items such as points. 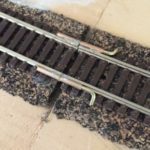 In more advanced layouts, the wire can be soldered directly to the rails for a more permanent fixture or when you want to conceal the wiring under the board on which the track lays but for beginners to model railways, the clips are more than sufficient. 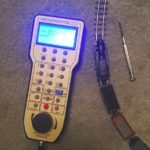 For the purpose of this article, I’ve focused on wiring an analogue controller to a single track section (probably an oval as per most starter kits) with just one set of wires from the track controller to the track. Wiring up more sophisticated layouts will be covered later. That’s it for this first part, next time around I’ll take a look at some of more often used jargon in model railway electrics. In the meantime, if you have any questions ask in comment below. Hi Andy, hope you can help me, I bought a Flying Scotsman loco and tender (ebay £50) it’s in great condition but it shorts out my 19 volt adaptor and wont run, it’s not caused any damage that I am aware of, I am new to M R what am I doing wrong or have I bought a bad train..?